Are you stout? Stocky? Incredibly hairy? Do you like living underground? Then this is the page you've been searching for! 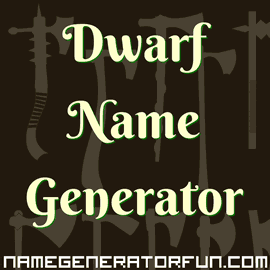 Uncover your inner self with our Warhammer dwarf name generator! We also have names for fantasy dwarfs, and Lord of the Rings dwarves. Simply select your choices from the form below and click the button to generate your name! Out of all the peoples of the Warhammer world, the dwarfs are one of the oldest, with a long history that stretches back into antiquity. Their empire may have faded, and they may no longer rule the lands between Mount Silverspear and the Grey Mountains, but they are still a proud folk whose dwelling place within the Worlds Edge Mountains remains a realm of splendour. The Karaz Ankor contains the main cities and holds of the dwarfs, and it is here in the capital city of Karaz-a-Karak that the major works of Dwarf history like the Great Book of Grudges and the Book of Remembering are kept safe from those who would destroy them. The dwarfs are split into four distinct peoples – the Norse Dwarfs, who long ago controlled a large area of Norsca; the Grey Dwarfs, who lost their original dwellings in the Worlds Edge Mountain and have now found new homes by colonising the Grey Mountains; the Imperial Dwarfs, who dwell side-by-side with humanity in order to assist those they see as the "heirs of Sigmar", the greatest friend of the dwarfs; and the Chaos Dwarfs, a tribe of physically mutated outcasts who turned their back on the Ancestor Gods, and now worship the rising tide of Chaos. It is taught in the Great Book of Grudges that the Dwarf god Grungi, the Lord of all Miners, was the one responsible for the majority of dwarf kind surviving the initial rise of chaos in the imperial year of -5500 IC. With his aid, they buried themselves in holds deep underground, and once they returned to the surface to find a world of twisted beasts and nightmare creatures, Grungi gifted his people with the arts of more advanced weapons and armour, so that they could fight back against the monsters that chaos had left in its wake. Many trials were faced by the dwarves in the generations that followed – from the first encounter with the Elves of Ulthuan, to the efforts of Grimnir to seal the third Chaos Gate and push back the nightmare hordes; from the glories of the Golden Age that followed, to the horror of the War of Vengeance against the Elves, and eventually to the Time of Woes that saw the collapse of the Empire of the Dwarves. The after-effects of this collapse lasted over a thousand years, pitching the dwarves against the voracious goblin races, and eventually leading to their first proper contact with tribes of humans. When the High King of the Dwarves Kurgan Ironbeard was brutally ambushed and abducted by Orcs, the men of the Unberogen tribe came to the dwarves' aid. It was the Unberogen chieftain's son, mighty warrior-prince Sigmar Heldenhammer, who led the dwarf/human counter-attack on the Orc army, and it was this battle against the terrifying Orc warlord Vagraz Headstomper that cemented relations between humans and dwarves. Together, the two races fought back against the Greenskin hordes, leading to the epic and bloody confrontation known as the Battle of Black Fire Pass. Ages of prosperity and hardship followed, as the forces of chaos arose again and the dwarves have since been locked into a permanent cycle of war against their age-old Greenskin enemies. The dwarves fight these wars with determination and grit – they are stocky, hardy people, resistant to magic, uniquely suited to living underground and carving out mighty cities from the living rock. They live in clans, ruled over by a High King, and revere their ancestors, especially the ancient deities like Grungi, Valaya and Grimnir whom they know as the Ancestor Gods. Expert at mining rare minerals, dwarves are cunning artificers and wily tradesmen, and their proficiency with armaments and mining guarantees that they will continue to forge their ultimate destiny as one of the greatest and most legendary races of the Warhammer world. Disclaimer: this is a fan commentary page intended to encourage interest in the fantasy race known as dwarfs. Our page is not an official publication and is not in any way affiliated with or endorsed by Games Workshop or any of their licensees. Copyrights and trademarks for the books, films, articles, and other promotional materials are held by their respective owners and their reference is allowed under the fair use clause of copyright law. Games Workshop have created a very extensive world in the Warhammer Universe, and their dwarf naming conventions information is quoted here under fair use. All information was gathered from factual reference material lists in the public domain. The extremely limited quotation of Games Workshop's works is in no way intended to harm or undermine the market value of those works, rather to encourage fans to engage with and seek out those works.